Interview with author and parapsychology investigator Michael Tymn examines the work of Leonora Piper. Alex Tsakiris: There are two ways we can look at this turn of the 20th century history. We can look at it in terms of forgotten history, which is the angle you take. If only we could go back. If an honest person, an open-minded person would look at this data it’s pretty hard not to be extremely aware that there is a significant amount of this history that’s been lost. But, I’ve got to wonder if there isn’t a totally different way of looking at this history. Isn’t it a textbook game plan for the kind of scientism, for the spirit of denial that we live in today? If you want to look at how to take overwhelmingly significant evidence and bury it, sweep it under the rug, and embarrass all the people who’ve touched it, here’s the way to do it. Mike Tymn: I agree. That’s one of the reasons I wrote this book and the four other books that I’ve written. It’s to try and resurrect this stuff because it’s so little-known. I’ve talked to a number of parapsychologists and they don’t know it themselves. I remember one who didn’t even know who Frederic Myers was. You talk about Leonora Piper, Sir Oliver Lodge, or Gladys Osborne Leonard, they’re all names they recognize but they don’t know any of the history. I don’t know what they teach them when they’re pursuing their degrees in parapsychology but they seem to avoid the early stuff. Today we welcome Michael Tymn to Skeptiko. Mike is the author of several books relating to afterlife communication and mediumship including, The Articulate Dead, The Afterlife Revealed, and his latest that we’re going to talk about today, Resurrecting Leonora Piper: How Science Discovered the Afterlife. It’s a book published by White Crow Books which is a place where you’ll also find Mike’s excellent blog. Mike, welcome back to Skeptiko. It’s great to talk to you again. Mike Tymn: Thank you very much for having me on, Alex. Alex Tsakiris: So you’ve written this book about Lenora Piper, someone who many people who are interested in mediumship and history in general might know, but I think there are a lot of people who don’t know who Leonora Piper was. I guess that’s the natural place to start. Mike Tymn: Leonora Piper was an American woman born in Nashua, New Hampshire in 1859. She discovered her mediumistic ability sometime around 1883 when she was 24. Her father-in-law had suggested that she see a psychic healer for some problem that she was having at the time. While she was seeing the psychic healer, she dropped off into a trance and she started giving information to another person in the room at the time, a doctor, about his deceased son. So that’s how she came to realize that she had mediumistic ability. Then she started experimenting with it now and then with friends. Somewhere along the line that first year, William James’ mother—William James being a Professor of Psychology at Harvard—had a sitting with Leonora and found it very evidential and told her husband, William James, all about it. So William James had his own sitting and was very much impressed. As a result, he signed up Leonora to be a research subject for the next 18 years or so. Alex Tsakiris: It’s Leonora, so I apologize for that. I’ll have to do that correctly from here on out. I do feel we need to lay the backdrop here, right? She goes on to become the white crow that many people who know William James know his famous quote about there only needing to be one white crow to prove not all crows are black. He’s really talking about psychic ability and ability to talk with the dead. But the timeframe that we’re really talking about here and the backdrop of that is interesting because we’re coming out of a period with Darwinism, with reason, with a move away from religious thought into this explosion of scientific free-thought. Now here are these folks at the same time who start getting this inkling that this spiritualism might have some real legs to it. Can you fill in some of the history gaps that I’m leaving out there? Mike Tymn: Sure. First of all, as far as Mrs. Piper’s first name, it’s either Lenora or Leonora. Lenora was her nickname and Leonora was her full name so either one is correct. As far as psychical research, the foremost psychical research didn’t really begin until 1882, when the Society for Psychical Research was formed in London. Three years later the American branch was also formed. It really goes back into the 11th Century, I guess you could say, when the Catholic Church was setting down formal guidelines for investigation of miracles involving saints. Then we jump up to 1741 or thereabouts when Emanuel Swedenborg was doing his own personal investigation of afterlife realms by means of clairvoyant and out-of-body experiences or whatever he was doing. He was going into the heavens and reporting on it. It wasn’t research of anybody else. It was his own personal research. Swedenborg is sometimes called the first spiritualist. Then we jump up to the key event on March 31, 1848 which was the Fox sisters in Hydesville, New York. That sort of kicked everything off. I’m sure many of your listeners have heard that story. There are questions about it, but in effect they heard knocks around the house and they had been hearing them for a number of weeks. All of a sudden these two young girls realize that they could communicate with the knocks. They’d get three knocks and knock back a certain number of times and get the same number of knocks back. Then they realized that if they asked a question and said, “Give me three knocks for a yes and one knock for a no,” or something to that effect that they could get an intelligent response. They called this to the attention of their parents and the parents experimented. It just took off from there, not only in Hydesville, New York but within a year this was going on all around the world, at least the Western world. People started looking into it and one of the first to look into it was Judge John Edmonds, who was a Supreme Court justice in New York. He was probably the first real psychical researcher. Edmonds sat with dozens of mediums. He thought it was all bunk initially but he soon came to believe it. He wrote the first real book on psychical research called, Spiritualism. There are several others in the 1850s, Robert Hare, who was a Professor of Chemistry at the University of Pennsylvania. He got into it because he wanted to debunk it. He thought it was just so much “madness” and he was out to put a stop to it but he became a believer after sitting with 22 or 23 different mediums. Then over in France there was Alan Kardec. He was conducting his own investigation and he also became a believer. We go into the 1860s and we’ve got Alfred Russel Wallace, who was the co-originator with Charles Darwin of the Natural Selection Theory. He was a total skeptic and after sitting with a number of mediums he also joined the believers. Up until 1870, that’s when the founders of the SPR, Society for Psychical Research, began to take an interest in the matter. Frederic Myers, who was a lecturer at Cambridge, a poet, his friend Edmund Gurney, and Henry Sidgwick, they became interested and began sitting with mediums. Then in 1882 they decided they needed a formal, peer-reviewed group to take a look at this material. That pretty much kicked off formal psychical research. As far as the times were concerned, it should be pointed out that the 1870s was really a time of despair. Myers talks about this quite a bit and William James does, too. It took about 10 years for Darwinism to really kick in and even before Darwinism, as you know, it was the Age of Reason, the Age of Enlightenment and so forth. People were falling away from the churches. Darwinism was sort of a knock-out blow. People thought if the world wasn’t created the way the Bible says then the whole Bible must be wrong. This resulted in many people, especially the educated people, falling away from the church and having nothing else to fall back on. As a result, there was a lot of what William James called “soul sickness.” James himself said he suffered from soul sickness at the time and had considered committing suicide. Alex Tsakiris: Does James and do other intellectuals at that time make that that connection between this nihilistic, Atheistic movement that’s going on that’s behind Darwinism and this soul sickness or this malaise that’s falling over people—is the connection understood at that point? Mike Tymn: They understood. They were looking for meaning to life. A meaning to life that seemed to have disappeared with Darwinism and the downfall of the Church. They don’t always come out and say, “We’re looking for evidence of the survival of consciousness at death.” In fact, the SPR when it was formed in 1882, they carefully avoided saying that they were looking for evidence for survival. They said, “We’re looking into thought transference,” which was a term they used back then which was later named telepathy. Alex Tsakiris: Mike, I think you point this out in your book and correct me if I’m wrong. Part of the reason they’re going down the telepathy route when they’re first investigating these mediums, it sounds almost so current, you know? It’s a repeat of so much of the research that’s been going on in the last 20 years. That’s that it’s more scientifically acceptable in a kind of strange way to say, “Oh, it’s this ESP thing that we don’t understand,” than to say it’s the survival of consciousness thing that we don’t understand. Do I have that right? Mike Tymn: Yeah, I think that’s the case. It’s just more scientifically acceptable today to talk about telepathy than it is to talk about survival. Alex Tsakiris: Even to the point where a lot of NDE researchers won’t go there when the connection is even more obvious. I mean, I still don’t understand how you can talk about near-death experience research and not immediately jump to at least dealing with some of the philosophical issues concerning survival. Yet that’s where a lot of folks feel they need to go and dance around that whole survival issue. So this was also very much on the minds of these researchers, in particular William James as he started this research at Harvard in 1885, is that right? Alex Tsakiris: You told us just a minute ago how this research starts. Maybe go over that period again. What is James trying to do and then he locks onto Leonora Piper and then where does it go from there? Mike Tymn: Well, Leonora Piper was probably the best medium that he had come across, at least in the United States. There were a couple in England that other people were looking at but he didn’t have time to do an extensive study with Leonora Piper so he helped organize the American branch of the Society for Psychical Research. They brought in Dr. Richard Hodgson, who was an Australian who was lecturing in England. He was primarily a law professor and in England he had debunked a number of mediums and also went to India and supposedly debunked Madame Blavatsky. They pretty much assumed that Hodgson was going to debunk Piper. Mike Tymn: Right. Hodgson had an open mind, I think. I can’t think of the person’s name offhand who was really President of the American branch of the SPR at the time, but he was out to debunk Mrs. Piper, too. His brother had been taken by a medium and he thought it was all bunk. I think he had more to do with choosing Hodgson than James did. Alex Tsakiris: Interesting. Tell us a little bit about that first reading Hodgson gets with Leonora Piper. You document it in the book and it’s quite fascinating. Mike Tymn: Well, I should explain. Mrs. Piper went into a trance. People don’t realize it and they think mediums today—they see John Edwards and Lisa Williams and James Van Praagh and so forth on television and they think that clairvoyant type mediumship represents all of the old mediumship when it doesn’t. It’s really quite a bit different. Mrs. Piper was a trance medium. She would sit down and it would take her a minute or two to go into a trance state. Her eyes would roll back into her head and all of a sudden her voice would change if it was a male. That’s what Hodgson was looking at, this woman speaking to him in another voice. The voice in this case was that of Fred, his boyhood playmate. Fred gave out some little details as to what they did when they were boys playing leapfrog. Fred actually had a fatal injury when he was 14 or something like that. There were other evidential details. I don’t recall them right now, but that got Hodgson to thinking maybe there was something to this. Alex Tsakiris: You know, Mike, it’s interesting. I just finished an interview with Dr. Julie Beischel, who you know, of course. You wrote a nice blurb for her recent book. In talking to Julie, we were talking about this topic of your first reading and a reading with a medium who gives you information that’s just highly evidential, that just makes you go, “Whoa! There is just no way.” It’s usually personal information and that’s how it was with Hodgson, too. He touches on some of the information from his first love that he doesn’t even want to share but it obviously affects him deeply. Julie mentioned this as well; I think this idea of getting around the trickery of a cold reading is something that isn’t that hard to do, right? You don’t give out a lot of information and also the information that comes through, if it’s of a very personal nature that no one else could know you immediately are a convert. It sounds like in a lot of ways that’s what happens to Hodgson. He’s a very intelligent guy. That’s another thing that comes through. These people are not–I don’t want to say they’re not inferior to us. You read them intellectually, they’re probably superior to us in a lot of ways, certainly in their writing and their speaking. I’d hate to have an email exchange with any of these people because I’d just be embarrassed by my grammar and my language. These were very intelligent people. So here’s a guy who has a reading and says, “Wow. There’s something here. I need to investigate it.” What happens after that? Mike Tymn: After that they actually signed up Mrs. Piper to a contract and Hodgson began sitting with her three times a week on the average. For 18 years he sat with her. Outside of a couple of trips she took to England, he had hundreds of sittings with her. He would arrange for other people to come in and sit with her. He would be present. He would sit there and take notes and record all of this stuff. One of the problems with that type of research is that they didn’t really keep count. Julie has told you probably and told me that her type of research you can put some statistical numbers to it and come out and say it’s 70% correct here and 60% correct there. Chance guessing would only be 5% or whatever. Whereas they didn’t really do that with Piper. You’ve got to look at the whole research to see and ask yourself if it’s possible that this information could have come through by pure guessing. One of the big problems was that William James didn’t seem to get this. In the research William James keeps talking about Mrs. Piper fishing for information but she really wasn’t fishing. One of the reasons I wrote the book is because the scientific writers, they don’t really set the foundation or give you the background. It took me three or four readings of the SPR records before I began to figure out what was going on. I didn’t know the difference between a direct voice medium and a trance voice medium when I first read it. That was confusing to me. Alex Tsakiris: Tell us, what are the differences there? Mike Tymn: A trance voice medium is one where the communication actually comes from her mouth. She goes into a trance and supposedly the spirit entity takes over her body and speaks right through her own mouth. In direct voice, the voice is coming from another part of the room and comes through a trumpet or something that magnifies the voice. The medium can be sitting there talking to somebody next to her and the voice is still coming through usually two or three feet above her or him and off to the right. So it’s not coming through the medium herself. The direct voice is sometimes called “independent voice.” It comes from some point in the air above the medium. At the time I was reading this I was reading some things about direct voice mediums as well as trance voice and it just didn’t really sink in as to what the difference was. The biggest thing that they didn’t explain was the control aspect. They keep talking about Mrs. Piper’s early control was a person called Dr. Phinuit. At times they would say, “Dr. Phinuit said this.” Other times they’d say, “Leonora Piper said this.” It was very confusing. That whole control process was never really explained. What happens is that on the Other Side, the spirit communicators, very few of them are able to speak through mediums for some reason or other. I think they have to put themselves into an altered state of consciousness in order to communicate and it’s like humans trying to meditate. There’s only a certain small percentage of humans that are able to effectively meditate. I think that’s the same on the Other Side. There’s only a small percentage of spirits who can put themselves into this altered state of consciousness that allows them to communicate through a medium. Alex Tsakiris: At one point in the book you talk about mediums on the Other Side. We should add that this is all just your gleaning this from these reports of these folks so it’s not like you’re saying this is true. It’s just their research that you’ve gone back and tried to sort through and give us the best you can. Go back to that point where they talk about mediums on the Other Side. That is, spirit mediums who are helping spirits on the Other Side connect with the human medium on this side. Do I have that right? Mike Tymn: That’s right. That’s what they call the control. The control was the medium on the Other Side. What the control would do is get the information from the spirit that was communicating. He would then pass it through the medium and then on to the sitter so that there was a lot of distortion going on. First of all, apparently the control doesn’t receive the information from the spirit communicator verbally. It’s by thought transference so a lot of time the control, Dr. Phinuit being the early control, he had to interpret what the spirits were telling him. Frequently he didn’t interpret it correctly and he would fish. So William James thought Mrs. Piper was fishing but Dr. Phinuit was actually occupying Mrs. Piper’s body and he was doing the fishing. He was trying to figure out what is this spirit trying to tell me? I’m not getting it clearly. So he would fish from the spirit, not the sitter, and that’s what James never got clearly or never stated clearly. Hodgson and later Dr. James Hyslop who succeeded Hodgson, they saw it very clearly that Mrs. Piper was not fishing. It was the spirit control who was fishing for information. Alex Tsakiris: You know, Mike, you’ve mentioned William James a couple of times now in less than glowing terms, which he’s always referred to, and you’ve written an interesting blog post a while back that I remember the title of because it sticks in my head. It was, “Is William James a Wimp?” I’d like to go into that for a minute because I think you come to the conclusion that William James, although he stepped into this territory that was even at the time toxic career-wise. He was brave enough to go there. He maybe didn’t go as far as he could have in terms of advancing this whole area and elevating it to a scientific level that would change the world more. Tell us about that. Mike Tymn: He didn’t want to have his reputation damaged by coming out and saying, “Yes, I believe in spirits and spirits are communicating.” That might have ended his academic career. Even today, as Julie and many others will tell you, if you start talking about spirits in an academic setting you’re risking losing your job. It was much more so, I guess, back then so he had to sit on the fence. Reading between the lines with William James, I think he believed in spirits. He made a number of statements that said he was leaning in that direction. But he didn’t come directly out like Hodgson and Hyslop and Sir Oliver Lodge and Frederick Myers. They all started as skeptics and at some point in time they said, “Okay, I’ve got enough. I now believe that spirits are communicating with us. I believe in life after death.” James never said that. He just continued to sit on the fence the whole time. Alex Tsakiris: I think a lot of times it seems like these researchers want to go two ways. One is to play it tight to the vest like William James did. In reading between the lines you can almost read this assumption that they have that in the long run this will play out. There’s enough evidence behind this, I don’t need to stick my neck out all the way. It’s just going to get chopped off. It won’t advance the cause. Let me play this middle ground here even though that’s not what I really believe. In the long run that will get us closer. The other person is the convert who say, “We can’t live in this world of hall of mirrors where we don’t say what we’ve really found and we need to come out and report it.” Don’t you see that same thing going on today? I guess you can make a case for either one. Sometimes if the public at large isn’t ready to accept an idea, maybe it isn’t best to go out with it too boldly. 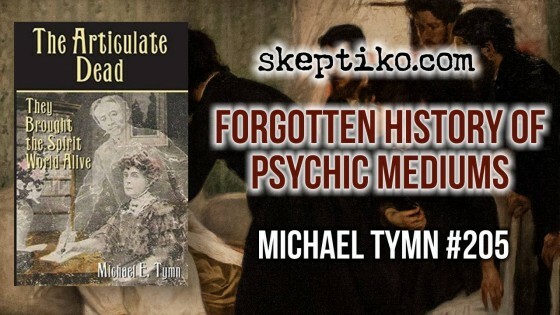 I pointed out to him that the researchers that I cited, which were Richetand Gustav Geley, and all those who did a lot of research with mediums who were giving off ectoplasm, they started as skeptics. They had already ruled out the skeptical side of it. So why do I have to bring in skeptics who saw it only one time or had this idea that it wasn’t true because there’s no natural cause for it or whatever? I said, “It’s already been addressed.” It’s this need for balance. Alex Tsakiris: It’s a false balance. It’s an artificial balance and it’s really a sleight-of-hand in turning science on its head. It’s the Dr. Richard Wiseman quote that says, “Hey, ESP has been proven by the normal standards of science but that raises the question, do we need a different standard?” I think that gets repeated over and over again. I guess I’d pull back from that and ask about the purpose of your book in general. Mike, you’ve done a yeoman’s job of chronicling this aspect of history, looking at it in a number of different ways that no one else has pulled together. You have an interesting perspective in this book, Resurrecting Leonora Piper. You know, I think there are two ways we can look at all of this information about this period. We can look at it in terms of forgotten history, which I think the angle you take of if only we could go back and an honest person, an open-minded person would look at this data it’s pretty hard not to be extremely aware that there is a significant amount of this history that’s been lost. I’ve got to wonder if there isn’t a totally different way of looking at this history and that’s almost like a textbook game plan for the kind of scientism, for the kind of spirit of denial that we live in today. I mean, it’s almost like if you want to look at how to take overwhelmingly significant evidence and bury it, sweep it under the rug and embarrass all the people who’ve touched it, here’s the way to do it. Just go back and look at this part of history. Mike Tymn: I agree. That’s one of the reasons I wrote this book and the four other books that I’ve written. It’s to try and resurrect this stuff because it’s so little-known. I’ve talked to a number of parapsychologists and they don’t know it themselves. I remember one who didn’t even know who Frederick Myers was. You talk about Leonora Piper, Sir Oliver Lodge, or Gladys Osborne Leonard, they’re all names they recognize but they don’t know any of the history. I don’t know what they teach them when they’re pursuing their degrees in parapsychology but they seem to avoid the early stuff. Alex Tsakiris: Well, parapsychology formally as it’s taught has become really anomalous psychology. It’s why people believe weird things. That’s where parapsychology is really being taken, so it’s not surprising that they’re not interested in history. But from another perspective it is interesting how we, in our modern age, in our iPhone, Internet age, feel a complete disconnect with even this history that’s a little more than 100 years ago. One of the things that I think your book does a great job of doing is connecting us with that time period and connecting us with the events that have gone on since then that become really smaller stepping-stones that help us see how the path has gone. That’s how I felt from the book. I felt, ‘You know what? I’m really not that much different than these people. I don’t know how anyone could have done it any different than they did.’ So what are your thoughts on our connection or our lack of connection with this time period? Mike Tymn: I agree with you that most of this has been filed away in dust-covered cabinets and people just don’t know about it. Part of the reason is not only because of the scientific fundamentalists but the religious fundamentalists. They oppose it as much as scientific fundamentalists. They read things in the Old Testament, that the dead know nothing and stay away from speaking with the dead and so forth so you’ve got the scientific fundamentalists on one side and the religious fundamentalists on the other side and not much left in the middle. That’s why we don’t know about it today. I have a very good friend who’s a lawyer. He’s a Born-Again Christian. When I start talking to him about this he thinks I’m representing the Devil. He fears for my salvation because I believe that you can communicate with spirits. This guy’s a lawyer—he’s almost a judge. Alex Tsakiris: You’ve chronicled this history and you’ve really gone much further in the book, Resurrecting Leonora Piper. Are you a believer in a pattern? Is there a direction that this is going? And is it being directed by someone or something? Mike Tymn: I think the early spirit communication was directed by the spirits themselves. There were messages coming through through a number of very credible mediums that indicated that Benjamin Franklin, working with Emanuel Swedenborg, is the one who figured out how to communicate by means of raps. You know, whatever it took to get these raps through from the Other Side. It was Ben Franklin and Emanuel Swedenborg who figured it out. There were a number of other messages indicating that there is a hierarchy of spirits there on the Other Side who were directing this and the problem was that the higher spirits had a more difficult time communicating with us than the lower spirits because they’re at a very much higher vibration level. So they have to come down through the various levels of vibration and they have to use lower-level spirits to get through to us. There were indications they were beginning to pull back after that. I think that’s what happened. I think they just said there was no point. There was a lot of physical mediumship going on and many genuine mediums were being disparaged and called cheats because people didn’t understand what was going on. It was just beyond their comprehension that there was ectoplasm and there were materialized beings emerging out of this ectoplasm. In the meantime there were actual frauds that became involved and people couldn’t tell the difference between frauds and the genuine mediums. So I think the spirit world pulled back. Then you have the whole psychedelic field and their research matches up with that. And you have the DMT stuff and Dr. Rick Strassman and people in the Amazon who are seeing aliens the same way that these people are seeing aliens. There’s this whole body of extended consciousness and you again run into this same kind of problem, which is if there’s this extended consciousness of other beings—we’ll call them aliens—why aren’t they landing on the White House lawn? You could say the same thing with our spirits here. Are they really so limited that they can’t communicate with us in a more effective way? We have all these folks that come forward as channelers or as people who have this special connection with these spirits and say, “Hey, here it is. Here’s everything you need to know.” And they’re often contradictory. One contradicts another. I just talked to Chris Carter. He’s written an excellent book and in part of our conversation he said, “I’ve come to the conclusion that we reincarnate three to four times,” because one of the sources he had he felt was very credible and that was their information. Well, that idea is contradicted by any number of near-death experience accounts, medium accounts, and other Gnostic texts that will tell you that that’s not at all true. So those are the kinds of explanations that even for the open-minded person I think creates a lot of confusion and a lot of uncertainty. Do you know where I’m heading there? Mike Tymn: I understand that. The other thing I was going to say is that I’m not sure we’re supposed to know with certainty. One quote that I’ve cited a number of times in several of my books comes from Victor Hugo’s research back in the 1850s. He was sitting with a number of mediums and he asked whoever he was communicating with through this one medium, he asked why it was so difficult and why doesn’t God better reveal himself? So in effect what he was saying is that if we knew everything for sure it would take away a lot of the challenges and the reasons we’re here living this Earthly life and it would hinder our progress. So I guess that’s the answer. We’re not meant to know for sure but we can at least have some assurance. I keep saying we’re never going to get absolute proof that consciousness survives death but we can at least move up to the 99% belief level. Alex Tsakiris: Fair enough. I wonder if we don’t also run into a problem when we put “we” in there instead of “I.” One of the conclusions I’ve come to is that this is about each person’s personal journey. Soul journey if you want to go there. But your journey through understanding and advancing yourself and trying to understand. So I often wonder if we start saying “we” and start generalizing and saying, “This is how all people…” I don’t know. I don’t know how anyone else is. I’m on my own little path, my own little journey. It may be relatable to you and to other people but it may just be the way God, for lack of a better term, has set things up to play out for me. Mike Tymn: I think so. I agree. Alex Tsakiris: Well, Mike, it’s been great. This is a great book that people should really check out. 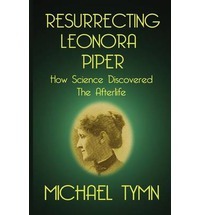 It’s Resurrecting Leonora Piper: How Science Discovered the Afterlife. It’s fascinating to just discover these great minds and how they handled some of the same questions that we seem to be wrestling with over and over again today. A great book. Thanks again for joining me, Mike. Mike Tymn: Thanks very much for having me on, Alex. I appreciate it.